Here is another sample card for my parents. I die cut the snowflakes out of the red background, so the card base shows through. Tomorrow is Thanksgiving. We are not hosting, but traveling to be with the in-laws. Have a happy & safe holiday! I’ll be back with a card on Monday. Supplies: Stamps – Penny Black, Stampin’ Up!, paper – Malmero Perle green, Neenah Classic Crest Solar White, Stampin’ Up! Real Red, inks – Copic BG10, BV25, C00, C1, G03, R11, R29, VersaFine Onyx Black, dies – My Favorite Things (pierced rectangle, snowflakes), tag punch – Stampin’ Up!, glitter – Ranger Stickles Icicle, embossing powders – Stampendous Detail clear, gold. 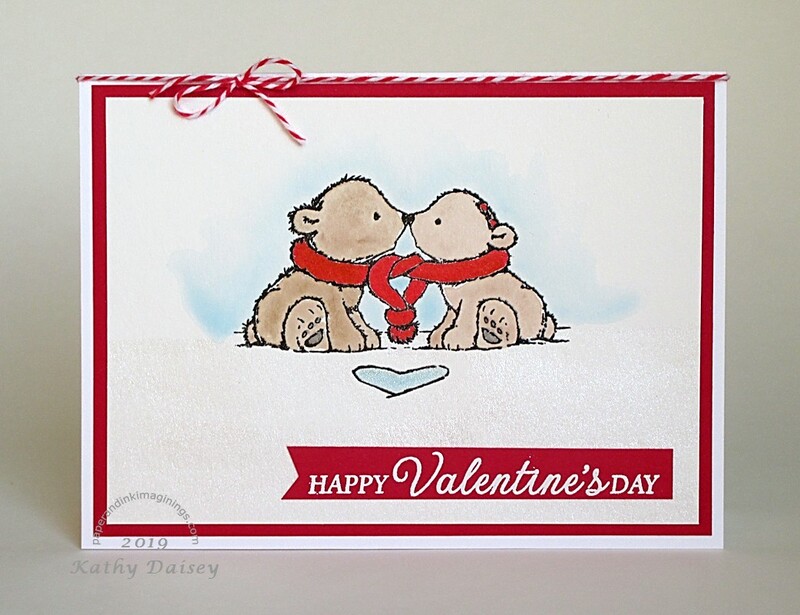 Categories: card, holiday | Tags: card, Copics, Malmero, My Favorite Things, Neenah, Penny Black, Ranger, Stampendous, Stampin' Up!, Tsukineko, VersaFine | Permalink. I dug out my Gerbera stamp, and bright Copic markers! Supplies: Stamps – Clearly Besotted, Penny Black, paper – Neenah Classic Crest Solar White, Stampin’ Up! Orchid Opulence (retired), inks – Copic E11, E23, E53, RV04, V04, Y13, Y18, YG03, YR04, YR68, Hero Arts Unicorn, VersaFine Smokey Gray, die – Lawn Fawn, embossing powder – Filigree Fine Arts Powder clear, white, organdy ribbon – Offray. 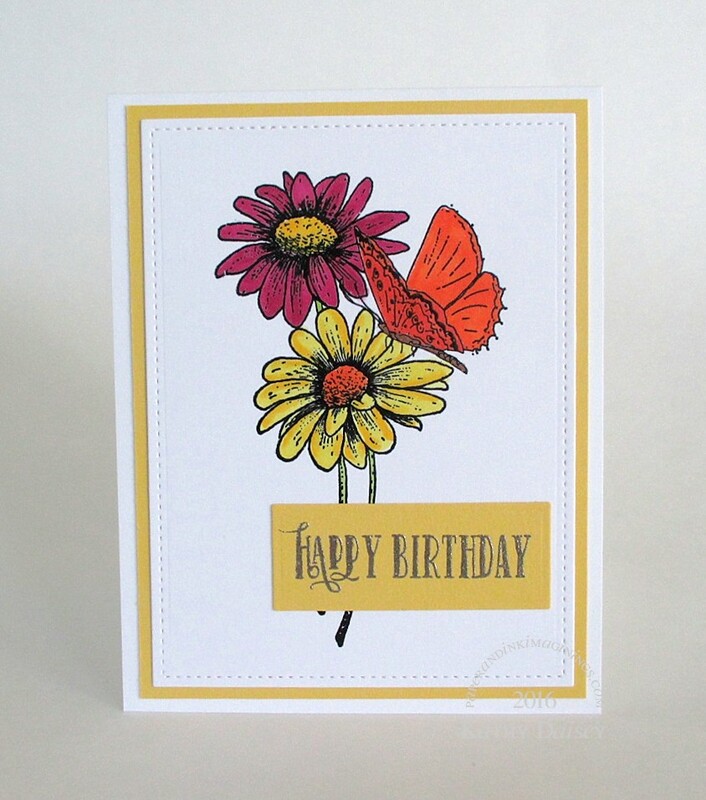 Categories: birthday, card | Tags: card, Clearly Besotted, Copics, Hero Arts, Lawn Fawn, Neenah, Offray, Penny Black, Stampin' Up!, Tsukineko, VersaFine | Permalink. Another card for the collection I am working on. Most of these cards are A6 size (4.625 x 6.25 inches). Supplies: Stamps – Penny Black, Stampin’ Up!, paper – Neenah Classic Crest Solar White, Stampin’ Up! Regal Rose (retired), inks – Copic E23, RV13, V04, YG03, YR0000, YR04, YR09, YR68, Y18, VersaFine Onyx Black, die – My Favorite Things, embossing powder – Filigree Fine Art Powder clear, metallic cord – PaperMart. 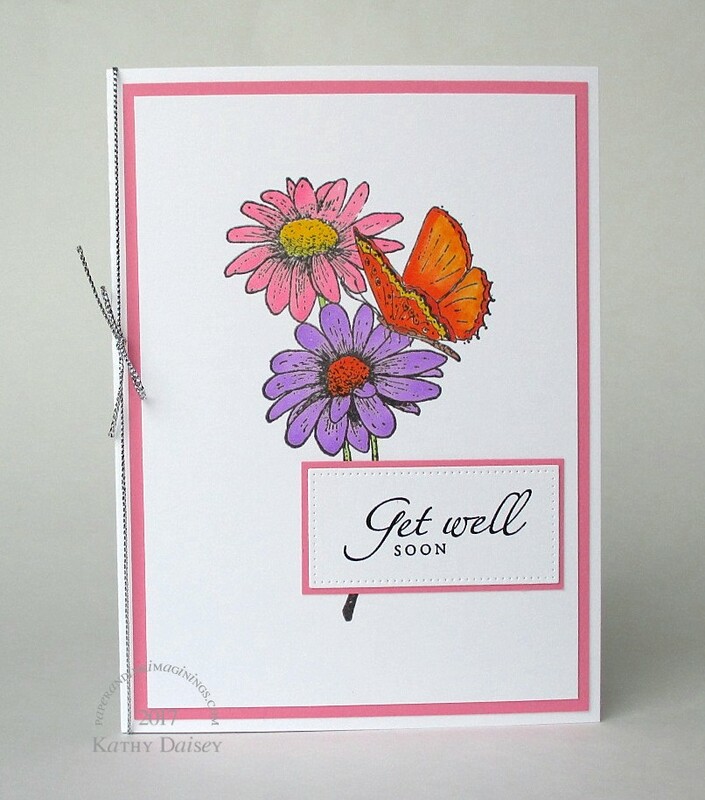 Categories: card, get well | Tags: card, Copics, My Favorite Things, Neenah, Penny Black, Stampin' Up!, Tsukineko, VersaFine | Permalink. These are the cards I made for my close friends who are mothers. The “Happy Mother’s Day” sentiment is on the inside of the card – I did not wish to cover up any of the watercoloring! The image was embossed in gold, then I used my ZIG Clean Color Real Brush Pens (I have the set of 12) to watercolor the image. I like to dip the pen in water to lighten the color. The tinge of blue background was done with an aqua brush. Supplies: Stamp – Penny Black, paper – Canson watercolor, Papertrey Ink Vintage Cream, ink – VersaFine Vintage Sepia, Zig Clean Color Real Brush Pens Blue (030), Brown (060), Carmine Red (022), Cobalt Blue (031), Light Gray (091), Light Green (041), Light Violet (081), Orange (070), Pink (025), Yellow (050)embossing powder – Stampendous! Gold Detail. Categories: card, Mother's Day | Tags: Canson, card, Papertrey Ink, Penny Black, Tsukineko, VersaFine, ZIG | Permalink. I found this Penny Black stamp on clearance last week. Love it! Flowers and butterflies don’t go out of style. Supplies: Stamps – Clearly Besotted, Penny Black, paper – Neenah Classic Crest Solar White, Stampin’ Up! Daffodil Delight, inks – Copic E23, E57, RV19, Y13, Y18, YG25, YR09, YR68, VersaFine Onyx Black, Smokey Gray, dies – Lawn Fawn (stitched rectangle), Spellbinders (rectangle), embossing powder – Filigree Fine Art Powder clear, Ranger Liquid Platinum. 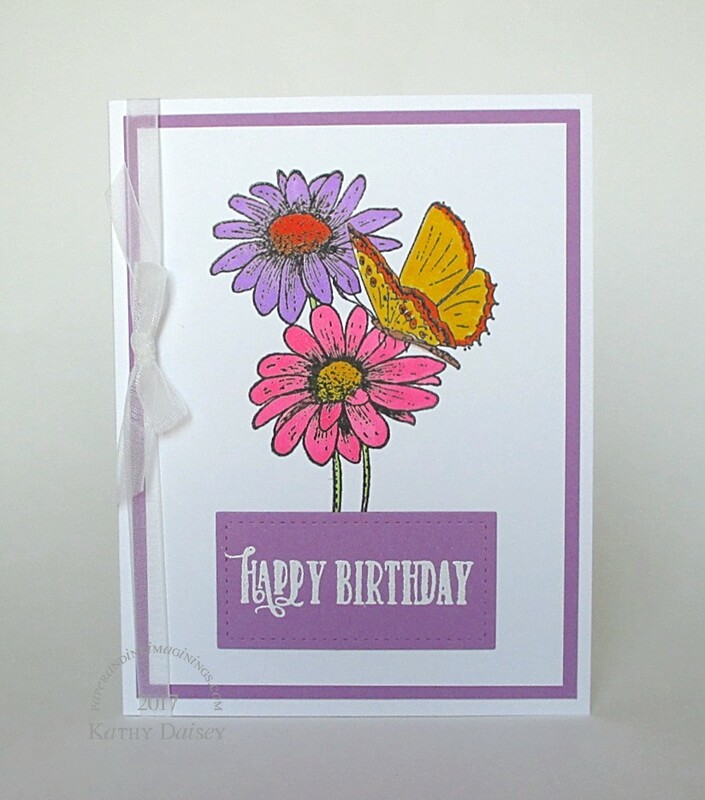 Categories: birthday, card | Tags: card, Clearly Besotted, Copics, Lawn Fawn, Neenah, Penny Black, Ranger, Spellbinders, Stampin' Up!, VersaFine | Permalink. I am working on some holiday cards this week. I bought this Penny Black stamp a few years ago for my parents’ cards – it is still super cute! Supplies: Stamps – Penny Black, Simon Says Stamp, paper – Neenah Classic Crest Solar White, Stampin’ Up! Brushed Silver, Marina Mist, inks – Copic B34, BG0000, C5, C7, E53, R11, R81, R85, YG25, YR09, YR68, VersaFine Onyx Black, Smoky Gray, dies – Spellbinders (circles), Taylored Expressions (banner), embossing folder – Provo Craft, embossing powder – Filigree Fine Art Powder clear, Stampin’ Up! Silver Detail Powder, organdy ribbon – ClearBags. Categories: card, holiday | Tags: card, Copics, Neenah, Penny Black, Provo Craft, Spellbinders, Stampin' Up!, Taylored Expressions, Tsukineko, VersaMark | Permalink.